Ellen Johnson-Sirleaf’s Nobel Peace Prize last week was not without controversy. It was received warmly by some (Nancy Birdsall of CGD), skeptically by others (Chris Blattman on his blog) – but almost everyone (including Mwangi Kimenyi for Brookings) agreed to deplore the poor timing of the prize: Ms Sirleaf is an international icon, but faces many challenges at home. As research has shown, the single most important determinant of solid democracies is not an election or two, but a peaceful transfer of power from one party to another. 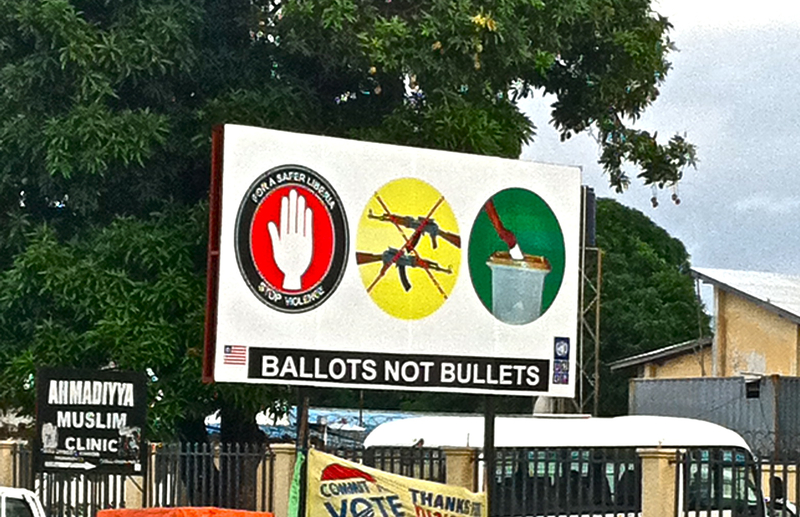 On the other hand, with the heavy involvement of UNMIL troops on the ground, and the hands-on international support that the National Elections Commission has been receiving in preparation for the big day, this election is also a test for the international community’s efforts in post-conflict state building. The world is watching, and hoping that Liberia has indeed permanently moved to the peaceful, democratic camp. This entry was posted in Liberia and tagged Africa, Democracy, elections, Ellen Johnson-Sirleaf, Harvard, Harvard University, Liberia, Monrovia, Nobel Peace Prize, President of Liberia, United Nations Mission in Liberia by Hala. Bookmark the permalink.